Requirements:Compatible with iPhone 3GS, iPhone 4, iPhone 4S, iPod touch (3rd generation), iPod touch (4th generation) and iPad. Requires iOS 4.3 or later. 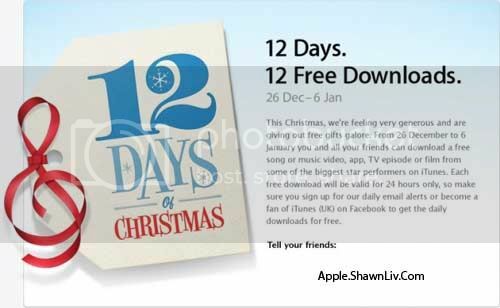 In this christmas we can download a fantastic selection of songs, music videos, apps and books for free. Each download will only be available for 24 hours. Get our special 12 Days of Christmas app to make it even easier to access your gifts while you’re on the go. Don’t have an iPhone, iPad or iPod touch? Don’t worry. Come back 26 December to download gifts from your computer.